Picture it: It’s Friday afternoon and all you want to do is get home. It’s been bumper-to-bumper on the highway for 45 minutes and finally, your exit is in sight. Just as you’re about to pull off for a more relaxing drive, some jackass decides this is the perfect time to pull out and almost sideswipe you. You lay on the horn, curse a few good ones, and tell him what you think of him with a rude hand gesture out the window. Anybody would be frustrated with that situation but if boiling rage is a common response for you, you might have some anger problems. Angry men are much more likely to drop dead of a heart attack or have a stroke than their calmer counterparts. 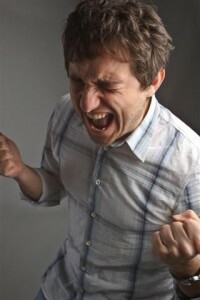 This article explains how to deal with anger problems with a little effective anger management. Anger is a complex physiological response to an outside or inside stimulus. Cognitive – The cognitive component of anger is the perception and feelings about an upsetting stimulus. We may believe we’ve been treated unfairly or an event may have startled or triggered us. As in the example of the near-miss accident, the initial cognitive perception would be, “Oh God, this guy is going to hit me!” The initial feeling may be of fear or terror. Physical – The physical component of anger is the way your body responds to an upsetting stimulus. Again, the example of the car accident comes to mind. Your stomach may knot up, your shoulder muscles may tense, and your throat may go dry. Behavioral – Next comes the behavioral response to anger. In the same example, if you’re feeling afraid that you’re going to be injured in an accident and the accident is avoided, your next response may be relief mixed with rage that the person frightened you that badly with their reckless behavior. Then comes the cursing, horn-blowing, and hand gestures. Dealing with anger effectively means understanding what it feels like in your body. If you can pinpoint the physical reactions you have to anger before it boils over into full-blown rage, you’ll be better able to control your response to emotions. A physical response to anger usually starts in the neck, shoulders, mouth, and stomach. The muscles in your neck and shoulders tighten, your mouth gets dry, and your stomach feels like a ball of rubber bands are sitting in its center. Next, your breathing becomes fast and shallow, your skin flushes, and you start to sweat. These physical reactions are a natural, healthy response to danger. It’s called the “fight-or-flight” response and it is designed to keep you alive in dire situations. This goes back to your caveman days when your fear and anger pumped enough adrenaline into your system so you could run away from that saber tooth tiger that wanted to make a meal out of you. In a modern world, we no longer have to worry about such threats. However, our bodies may still over-react to less-than-dire situations such as being cut off in traffic, being overlooked for a promotion or being criticized by your partner. The next time your anger is triggered, understand that these responses are happening because you feel threatened. Be aware of your physical response, learn to take control, and you’ll be less likely to blow up. The last thing you want to hear when you’re boiling over with rage is, “just take a deep breath”. It sounds condescending, especially if you’re hearing it from the person who just ticked you off. However, it is good advice. When you start noticing your neck tightening or your mouth going dry, take ten slow, deep breaths. Breathing helps get more oxygen to your brain and helps relax your muscles naturally. It also gives you something to focus on while you’re trying to calm down. If you’re constantly blowing up at people because you feel they don’t listen or they’re always undermining you, they may be intimidated by you. Dealing with anger means understanding how your anger affects other people. For you, it may feel completely justified, but for them, they just can’t figure what you’re so angry about. Everybody’s perception of reality is a little bit different based on their development, upbringing, and experiences. Talking out your feelings of frustration can go a long way in clearing the air and making sense out of constant misunderstandings. Sometimes it does no good to talk when you’re angry. If you’re already shaking with rage, you’re liable to say something you’ll regret later on. Before you let the insults fly, walk away, and write down how you feel about a situation. This can be in a notebook or on a computer. If the person you’re writing to really cares about you, they’ll take what you’re telling them seriously and it will open a deeper understanding about how their behavior is affecting you. When it comes to effective anger management, it’s really important to know when to walk away. Though it’s not possible in all situations, walking away is the best way to take the time to breathe, think, and re-evaluate the situation before reacting. According to a study published in the Journal of Sports and Exercise Psychology, men who exercised before being exposed to a series of upsetting images showed less “anger-specific” electrical responses in their brain activity. Cardio exercises such as running, biking, swimming, and cycling can release feelings of anxiety and anger and help balance your emotions. Sometimes it’s easy to overreact with emotion when you’re triggered. One of the most effective ways of dealing with anger before it gets out of control is putting yourself in the other person’s shoes. Take the guy who cut you off in traffic. Instead of immediately seeing him as an incompetent jerk, imagine him as a guy who was just told his house was on fire or his child got hurt at school. Even if this isn’t the case, it can help redirect your anger by replacing it with feelings of compassion. Being aware of how anger feels in the body is the first step to dealing with anger effectively. The next step to anger management is the practice of mindfulness. When you’re more aware of your mind, body, and emotions, you’re more in control of them. Regular practice of yoga and meditation can help you get more in touch with your body and breathing so you can translate that control into everyday life. Expectations are the single easiest way to live in a constant state of anger and disappointment. You expect your spouse to call you when she’s going to be late. You expect your boss to talk to you with more respect after years working for him. You expect that stranger in the car ahead of you to use his turn signal before making a right. Friend, family or stranger, anyone has the ability to disappoint you if you let them. Let go of expectations. Nobody else lives in the same exact reality that you do. Meaning nobody, not even your twin brother, thinks and processes information exactly the same way you do. No two people share the same beliefs, ideals, and morals. Once you understand that, you’ll be less tempted to take every small slight personally and stuff will just roll right off your back. When anger problems become too difficult to deal with on your own, you might want to consider joining a support group. There are plenty of online and local anger management groups available for men to share stories, tips, and camaraderie. Some men just have a short fuse. If you’re one of them, these anger management tips can help. However, when anger is chronic, it could be a sign of depression or post traumatic stress disorder. Chronically angry men may benefit from speaking with a trained therapist about their anger as this can help get to the root causes and triggers of constant rage. Everybody gets angry once in the while. It’s a natural emotion designed to help us stick up for our rights and protect ourselves when we’re being wronged. However, chronic anger can lead to lasting emotional, health, and social problems. If your anger regularly leads to violent verbal or physical attacks on those you care about, don’t be ashamed to ask for help. A weak man isn’t the one who reaches out for help; it’s the man who continues to abuse others because of his own unresolved issues.